I have never been to a show as emotional and beautiful as the one I saw just about an hour ago..... I can't really compare this show to any of her previous shows, because I was only 11 months old when I first saw Stevie (w/Fleetwood Mac, 1980). My mom says that when I was a baby, the sound of Stevie's voice would soothe me, and I'd stop crying.... I can't say that's true for tonight, however, because when Stevie first stepped on stage, I almost started to cry, I had such an intense emotional rush. Stevie played tonight on her last date of the tour... She sang a couple songs that she says she never gets to sing onstage: Garbo, I Never Promised You A Rose Garden, and a few others, I can't remember (I'm still in total shock that I saw her). Her voice was in perfect form, and Stevie looked stunning (but then again, when does she not?). It's no surprise to this writer that the Stevie Nicks Enchanted Tour ended on a night when the moon was full. And in a town called Portland, Oregon. With 7 different shawls and 2 complete costume changes, Ms. Nicks entertained a crowd of mostly aging baby boomers and a handful of younger fans. One was about 5 and wearing a light blue tutu. She sat in the front row. The show opened with a light electrical set and a tune called Outside the Rain. Picking up the pace, Stevie announced to her band members that since this was the last show of the tour, they could feel free to get all their aggressions out tonight. Apparently the band fared well over the last 40 shows because there didn't seem to be a lot of aggressiveness, only fun and frolicking among the players. The third song into the set, Ms. Nicks offered her first trade mark twirl during Gold Dust Woman. Ad-libbing a bit ("pick up the pieces, pick up the pieces, pick up those pieces..and go on") the crowd began to show signs of life. The song Rhiannon was next and Ms. Nicks began to infect the audience. A rolicking Gold and Braid and Whole Lotta Trouble followed. Stevie showed her talented trademark tambourine playing during these songs. A lax security let front row patrons and fans to the stage at this point. The band then formed a standing/sitting horseshoe as some members picked up acoustic instruments. Stopping a moment to explain how the next three songs came to be, Stevie related how they were written during her career when she and former lover/fellow FM player Lindsey Buckingham were a duo and an item. The set began with After the Glitter Fades, followed by Garbo which she explained was written right after her infamous picture of what now appears on the album titled Buckingham/Nicks. She poigniently related how hurt she was at the time for having to have posed for the shot. Next was Rose Garden. Stevie explained how the song was so very prophetic because she knew in her heart that she was on to something big. And she couldn't have been more right in her feeling and in her words to this song. Next, with lighters glittering throughout the audience, Ms. Nicks and her guitar player stood solo and performed an awesome and flawless rendition of Landslide. When the set was over, Ms. Nicks approached the microphone and announced warmly "Now that that's over, I'll be right back." And she was escorted off stage. Now halfway into the show, the audience was treated to a solo by the drummer and percussionist. The crowd was pleased with the talent and broke into cheering several times during the solo. The keyboard player took the stage and added a hot synthesizer melody as Ms. Nicks came out in her traditional black and gold "Stand Back" shawl. This was clearly her favorite song of the night. There was much dancing on stage, including a mambo with her guitar player which drew plenty of applause from the audience. The song written for the movie "Twister" titled "Twisted" came next with a definitively different version edge from the song off the Enchanted set. It had a much more bluesy feel to it and was this reviewer's dream. Afterwards, the bass player decided to be a crowd pleaser and went to the edge of the stage and shook hands with fans. Another brief exit from the stage followed. The trademark bongo solo began soon followed by opening stanzas for "Edge of Seventeen." Ms. Nicks emerged from right stage in a glittering silver dress and pleased the crowd to no end with flawless vocals and her customary handshaking with those standing near the edge of the stage. The group's first encore, a Tom Petty cover titled "Need to Know," seemed to have taken the audience by surprise, however, Ms. Nicks thoroughly enjoyed it. The second and final encore was "Has anyone ever written anthing for you." There were several shouts from the crowd "We Love you Stevie..." About 3 lines into the song, she turned to her right towards the bass player, put her hand to her mouth and took about 4 steps away from the microphone. She continued her turn around and sang the rest of the song. Those who know where wondering whether she was going to finish the song with a dry face. Amazingly, she did. After the last encore Ms. Nicks lovingly brought all of her cast and crew onstage including her dog Sarah, whom she affectionately introduced to the entire audience. She thanked everyone for making this truly special night, the last night of her tour, even more special. She also wished the traditional, "Take care of yourselves so we can come back and do this again." Stevie played the Rose Garden last night in Portland, OR. Stevie was awesome, the caliber of musicianship was unmatched by anything that is being produced by some artists today. One reason I enjoy listening the Stevie's music is her music is about her life. By listeing Stevie's music a person learn's the music business is not an easy way of life. However, just living life is not easy at times either. Stevie's band, the songs Stevie sung were done beautifully and the whole concert was well done. What can on say about Bozz Skaggs. Skaggs was outstanding, his band was excellent. I thought I could not love, admire, be inspired by or be awestruck by Stevie any more than I am already...boy was I wrong. I was in such a daze after the show that when I was driving home from Portland to Salem...a drive I've made hundreds of times...I somehow ended up on the northbound freeway instead of the southbound (I still don't know how that happened!). When I figured it out, I picked THE wrong exit to get off. You know, usually when you get off the FW, there is an onramp right there? Not this one! Anyway, I was totally lost and a 45 min drive turned into a 2 hour drive. Oh well, it gave me more time to reflect... Soo, before the concert. I went to my friend Jeff's (from the Enchanted list) hotel to pick him up. I had already told him I'd take him to and from the concert. He's from Idaho and this was to be his 4th Enchanted concert! Well, to my surprise, and excitement, in his gratitude for the ride, he gave me, yes I said GAVE me 6 Stevie LP's!! Bella Donna, Wild Heart, RAL, OSOTM,AND....BUCKINGHAM/NICKS AND TIMESPACE!! The Timespace vinyl, I hear is almost non-existent. This is a Japanese import. I almost had a stroke when he whipped out all these LP's and gave them to me!! All these years, I have never been able to find any Stevie/FM vinyls (well, except of course Rumours), and he knew that. God, that was great!!! At the concert I bought three shirts...the blue lamp pointing one, the "lacehead" one and the one where it looks like she has pink wings. I got the tourbook (cool! ), a keychain, the postcard and the button...I'd been budgeting for three months, okay! Give me a break!! :-) Soo, Boz. He is awesome! Man can he sing the blues. I've always liked him and I would have gone to see him by himself. If you guys liked him at the concert, check out his CD from 1994 (I think) called "Some Change". It's a must have if you like the blues. His backup singer, Lisa, is awesome and needs to be a big star someday! She was funky...totally into it! Oh, Boz had this tube attached to his mic that was blowing out smoke...hmmm...lol! Soo, security. "Ours" was funny. He was sitting directly in front of me, so we made eye contact often. During Boz, though, he was falling asleep! No lie! He told us we could go to the stage after the 12th song...when he told us this, he finished up by saying "So behave yourselves, okay." So my friend, Moongirl and I kept count. At about the 10th song, he started getting antsy and was on the edge of his seat, looking back and forth at the other guards...like he was saying "Alright, when already?" I kept looking at him like "When?" and he would smile and give the had thing like"Just a minute." He was nice. Soo, after the concert. We were on our way to where the buses leave and as we were walking a man looked at me and said "Hey, you look like her!" HA!! Best compliment I ever got!! So we get to where the buses are...I didn't realize she had such a caravan!! Like five buses and five trucks! Anyway, we saw her get on the bus and As the bus pulled out, I was in a spot where I was looking head on into the bus and she was sitting there holding Sara (the dog!) and waving to us with a huge smile on her face. Then she was gone :-( We met a cool couple from Seattle who said this show was better than the Gorge, and Jeff said that of the four he'd seen (Reno, Denver & Phoenix), this was the best one! So the four of us are standing there talking and this man with a backstage pass walks by and Jeff...the ultimate collector...asks if he can buy it. The guy says "but no ones here now, they're all at the party" , like he didn't understand the concept of just wanting it, ya know. Anyway, so I said "Party??" and he says "yea, I'm Sharons brother and I have to meet her there" or something like that, so we're all "SHARONS BROTHER??" and proceeded to sing her praises. So again, I said "Party??" and Moon says "So are you inviting us to this party?" and he says sure and looks at Jeff..."Do you have a phone #" So Jeff gives him the card of his hotel. So the guy leaves and we realize Jeff didn't put his room # or name on it! So, we go back to where the buses were and there is Sharon standing with some people. When Jeff mentions that her brother asked for his phone #, but he forgot to put rm # etc...Sharon goes "Umm, I don't have a brother" and we all go "You don't?!?!" She said no again. UGG!!! What a jerk!! To build us up like that...UGG!! That sucked!! Oh, and just after the concert, behind the speaker we were by, I found a flyer with a picture and description of the stalker...creepy! Anyway, sorry this was so long, but lots happened!!! Okay, my next post will be THE CONCERT!! Hello all :O) Well I have to say this was the best night of My life :O) Stevie was so stunning and Wow is all I can say she rocked the Place. I have to tell you not many here menchend the lighting it was so beautifal purples,deep blues, and pinks and the stage just glowed. Well the song list was on the money except No Stop Dragging My heart Around OH well !!! "Stand back" rocked the people on the floor stood almost the whole time and so did I but I wish that more people in the upper seets would have too. Well she talked alot to the crowed and that was so sweet her voice was so soft and she giggled a few times saying that she had never talked to the fans that much ever in the 25 yrs of performing it was great!!!! well the Crowd started going up to the stage before "whole lotta trouble" and were there for about three of four songs. Well Ege of Seventeen started paying and I just jumped up screeming I was dancing and singing to the song it rocked. Well I must add the "Lanslide was so beautifal she decated it to a person named Jade and to her crew and thanked them for all there hard work but the best part of the song was that you could here the crowd sing to the song and I beleave that she could here us cause she smiled really big. 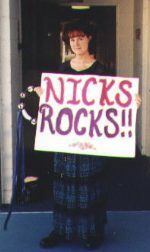 :O) well I have taken enough of your time but if you attended this concert or any on the tour you know that Stevie Nicks is the Best!!!!!!!!!!!!!!!!!!!!!!! and we all love her :O) OH yeh she sang "need to know" and "Has anyone ever written anything for you" and it was like she was singing to just to each indaviduale in the crowd and she said when she came out for the Encore she said "I would never leave you without a Tom Petty song" well thats it but the night was spellbounding Simply "Enchanted"
The concert was really a night to remember, clearly Stevie wanted to relate to her fans on a more personal level, the brief feelings about the songs before she sang them was an extra special addition.She pretty much did the set the same as described in all the other reviews, but when she introduced the band, she said Thank you to them for all their help on the tour, it was really sweet. Her voice was perfect, and she didn't miss a beat, she did mention several times that she can't wait to do this again, and that she had a lot of fun! I have to say that the venue and the crowd is what surprised me the most, or should I say disappointed me.... First, everytime someone would stand up and start to dance, which was hardly ever, security would tell them to sit down! I had taken a sign in that read, "NICKS ROCKS", and brought my tambourine, as usual, but the odd thing was that no one else did, this is the first Stevie concert that I have been to where this happened. I was afraid that if I started to play, people would get mad, and I was right, some did! But most people really liked it. When Stevie started playing "Whole Lotta Trouble" the first three rows went up to the stage, no one else was allowed, I thought it was strange since only a few people brought her things, a little girl tried to go give her a gift too, but security took it from her. When the concert was over, I watched several people taking things off the stage to take home, flowers and gifts that other people brought for Stevie!!! I couldn't believe it!!! I don't think I will ever go to another concert there.